I’VE WIPED the ceramic frog, the rooster too. And I’ve dusted the metal milk can, the one with the skeleton musicians playing round and round. Now I’m sitting on a wicker rocker, watching the sunshine, hearing the wind chimes and guitar (Alacrán by Reflejo de Luna) from the player in the living room. The window’s open. There is a vine with red flowers climbing yon wall (Did I say yon?) and it’s making friends with its aloe vera neighbor on one side, ignoring the bougainvillea on the other side. Nature discriminates (and so should you). I have wiped the patio table and its four chairs, and I raised the umbrella (you can see it up top) just in case the urge to sit out there comes over me later today. I also yanked some weeds and cleaned the Honda’s back window of grime. So here I sit on the rocker, hearing birds. I really need to water these potted plants in front of me. That’s for later. Oh yeah, I cut a rose bud for the dining room table. It lends a romantic air. Verily, you are a hive of activity today. Ms. Shoes: There just are not enough hours in my day. Looks like you’ve had a full day for a retired guy. For me, that is definitely a full day. However, today I’m making Cajun boudin. Fall is only a couple of days away. Carlos: You can not fathom the degree of envy I feel at this moment for your boudin. I love dat stuff. You are such a romantic, Felipe! Orale! Your wife is a lucky woman. The yard is looking good! 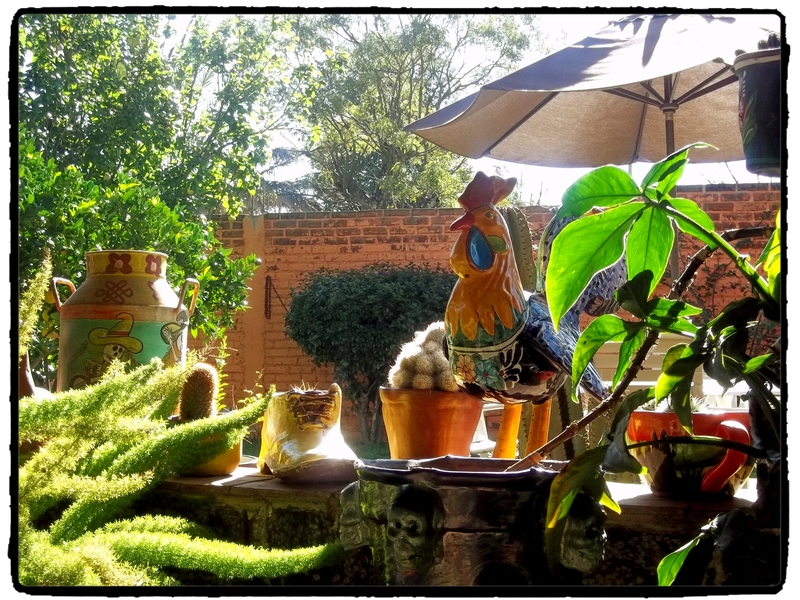 Love the ceramic items in the yard! Mike G.: I am a romantic feller, and my wife is indeed a lucky woman. Don’t break out in a sweat. Tancho: The air here is too cool and nice to sweat. I don’t think I’ve sweated in 14 years … since I left Texas. No, wait. I sweated a bit when I used to mow the yard, but I mow no more. Carole: It’s almost 6 p.m. now, and this has been the most spectacular day in months. Not a serious cloud in the sky, quite a contrast to every day since June when the rainy season started. Maybe it’s gonna wind down a bit early this year. Hope so. Would be a blessing. We’re waterlogged. I totally agree, and what is more, the pink cosmos have begun to bloom in the fields here. After I had an excellent 1 1/2 hour massage, we went to Mariscos La Güera for lunch, where we were personally greeted by the head waitress and then chowed down of some tasty tostadas and more. We choose to sit in the sunny area beneath a skylight, but far enough away from the obnoxious outpourings of the rockola (juke box). Señor Cuevas: I too noticed the blooms of fall on a ride to the state capital a few days ago. Everything is looking good and on schedule. Well, you can surely thank your lucky stars you haven’t been in Houston the last couple of days. Almost total washout. Carole: It would take lots of washouts in Houston to equal our rainy season, which goes on daily for four-five months. However, today was a total beaut here. Wish you’d been with us. A lovely morning at the hacienda. My turn will come…. All I need is patience. Peter: If you wait too long, planning, it may never happen. Jump, I say! This past week I bought some more artisan made pots, potting soil and flowery plants. Fall is the best season of all. Andrés: For me, the best specific month here is November. The rains have gone. The world is still green. The cold of winter has yet to arrive, and the dusty dryness of Spring is far ahead. Definitely, November.